Has won world and national awards. Has judged and conducted seminars in numerous states. 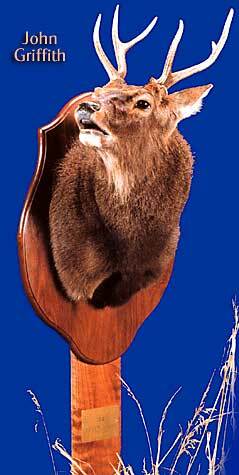 Recipient of the Award of Excellence given by the National Taxidermy Association. Recognized for expertise in Big Game Mounting. John Matthews, Brian Dobson, Ken Walker and Joe Meder. You are visitor number 3809530 to the Taxidermy Net. ABOVE RIGHT: Brown trout with water scene by Mike Orthober of Wisconsin, North American Champion for coldwater fish at the 1996 National Taxidermists Association Convention held in Columbia, Missouri. 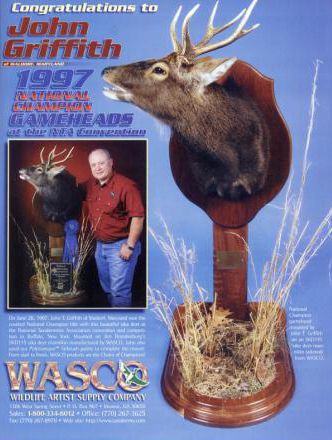 ABOVE LEFT: Sika deer pedestal shoulder mount by John T. Griffith of Kentucky, winner of the 1997 National Champion Gamehead Award at the National Taxidermists Association Convention and the Best of Category Gamehead at the 1999 World Taxidermy Championships. © 1997-2004 WASCO Manufacturing, Inc. All Rights Reserved. This page last updated 04/06/04.